Lets play a little game of visualization, shall we? I want you to close your eyes and imagine the most culturally vibrant city in the world, where everywhere you turn theres either a bar or nightclub, and no one seems to ever sleep as the party lasts all day, every day! Did I happen to mention that its on an island, almost separated from reality? Now I want you to picture a little slice of heaven amidst all this hedonism, a grassy, artificially-created sanctuary where residents can go to seek even more pleasure, often in the form of music. If youve never been to Montreal, I cant emphasize enough how much of a party city it is, something I think a lot of bands discovered over the weekend, one in particular being NYCs The Walkmen. 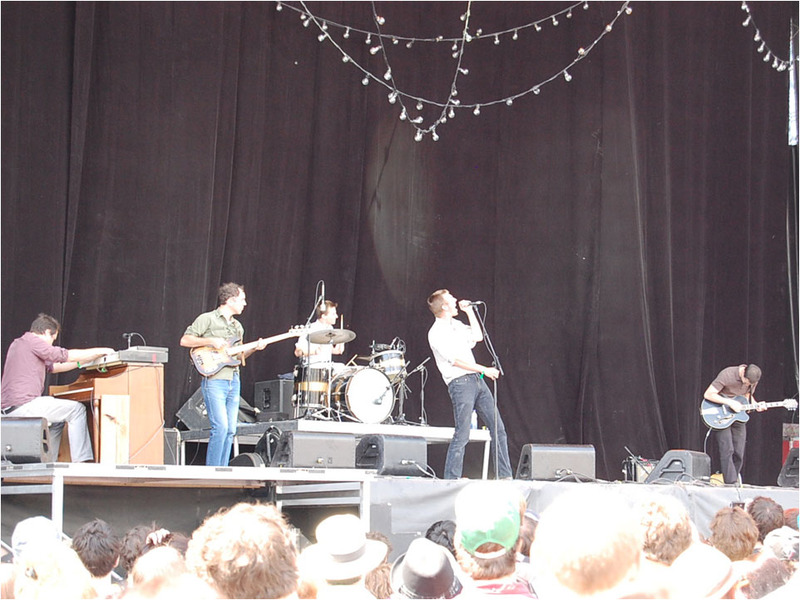 I say this because singer Hamilton Leithauser and the other four Walkmen presented themselves as the very definition of the word casual while the people they were performing for were ready to booze it up and rock from the moment they entered the gates. Leithauser spent the majority of their half-hour set (which they drove 14 hours for, he told us) with his hands in his pockets under the dangling Christmas-like lights set up in anticipation for Pavement. 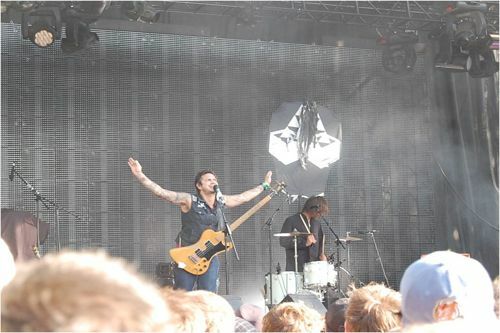 They used the brief time they were given to showcase tracks like “Victory” from their upcoming album Lisbon, and closed with In the New Year from their excellent 2008 effort, You & Me. I was looking forward to perspiring to Cage the Elephant on the main stage at 2 p.m., but they apparently had border issues Saturday morning that prevented them from appearing at Osheaga. 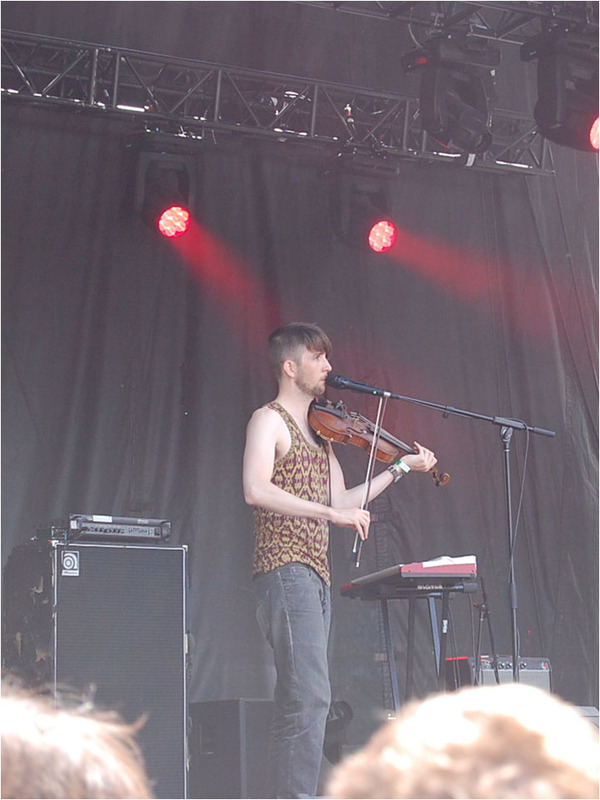 I decided to head back to the Sennheiser area for some violin action from Owen Pallett. It was a pretty weird scene when I got there. Pallett was already on stage, looking as if he was doing his own sound check, occasionally pausing to badmouth the technicians in the big white tent. A good 10 minutes after he was supposed to start, the overhead lights suddenly went on, presumably starting the set. Another ten minutes or so after this, his guitarist awkwardly showed up, who would later switch to playing some sort of drum kit. Although instead of beating them with sticks, it was like he was vigorously scooping ice cream out of the inside of the drum, producing a pretty unique and cool sound. Were not a festival band, Pallett announced roughly halfway through, and Id have to concur. The guy is infinitely talented, doing things I have never seen before like screaming at his instrument to get an echo effect, but maybe he should stick to playing operatic quality venues where you can actually hear and appreciate his skills. The problems he was experiencing continued right through til the end, to the point where Pallett apologized to everyone and simply up and quit before he was able to finish Lewis Takes Off His Shirt (from his first non-Final Fantasy album, Heartland). Even though I had just seen them a few weeks ago at Ottawa Bluesfest, I hurried back to the twin main stages for Montreals own Stars, paying little attention to the massive sing-along for Knaans “Wavin Flag” so I could grab a good spot close to the front. The crowd already gathered for Stars had to be at least two to three times the size of their Bluesfest audience, and band members Torquil Campbell and Amy Millan showed their love by continually hurling bouquets of white roses to their admirers. And apologies in advance for the pun, but these Stars shone just as bright during the day as they did on that Ottawa night. itll be winter soon, Stars blazed through 12 songs in just under an hour, many from their recently released album The Five Ghosts (including “We Dont Want Your Body”, “The Passenger”, “Fixed”, “I Died So I Can Haunt You”, and “Wasted Daylight”). I feel the overwhelming need to come clean about something  Im a 37-year-old whos been an alt-rock fan since the genres glory days of the early and mid-90s, but I cant say Pavement were anywhere near my radar back then (and its not like I only listened to what was popular on the radio). 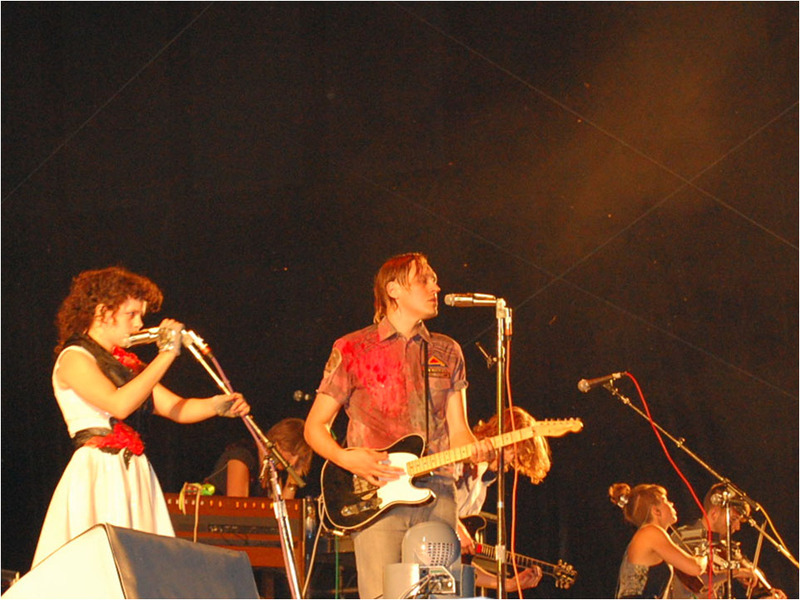 So I cant lie; their whole reunion thing this year meant very little to me, but I decided to give these self-proclaimed California slackers a chance, and not just because I wanted to be up front for Arcade Fire a few hours later. They had barely finished second song “Stereo” when for whatever reason, Stephen Malkmus got drilled with a full plastic cup of Budweiser (And keep in mind, Canadian beer is stronger!) The crowd collectively gasped, thinking that this was going to be the end of Pavements Montreal comeback before it even began. We all braced for the worst, knowing the citys unfortunate penchant for a good riot. Malkmus earned his awesomeness badge and then some by calmly toweling himself off and complementing his assailants pinpoint accuracy. Hes obviously a sports fan, as later he asked how Montreals Canadian Football League team the Alouettes were doing, and also dedicated “Fin”, the last song on 1997s Brighten the Corners to the Montreal Expos, the much beloved baseball squad now plying their trade as the Washington Nationals. 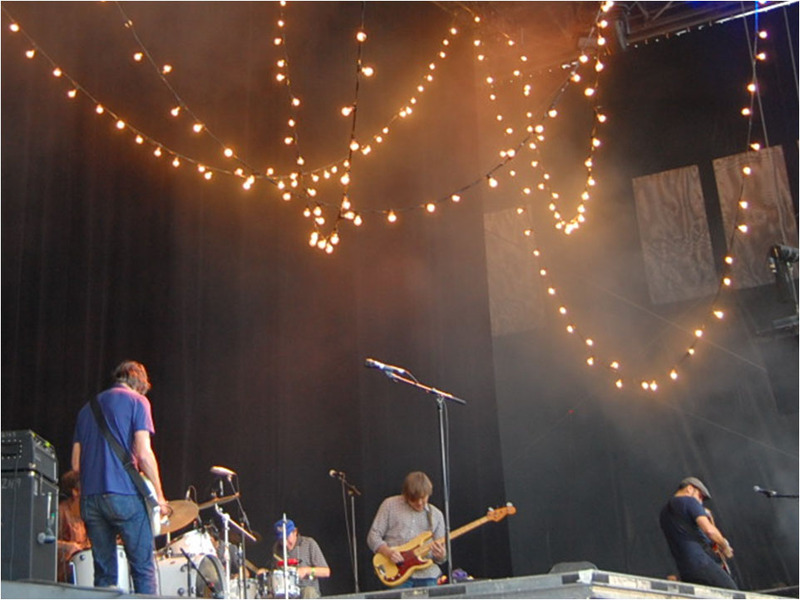 Pavement definitely won me over. Good job, boys! 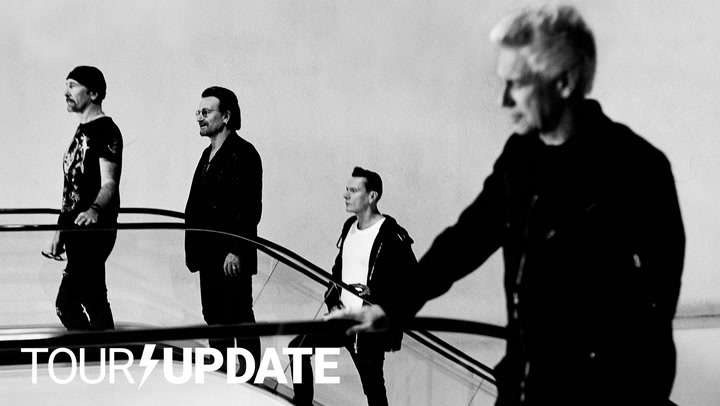 yeah, Im talking U2-type popularity. Maybe not right now, but theyre definitely on their way. I know theyre webcasting from Madison Square Garden later this week and headlining Lollapalooza, both of which will be huge, but there was something majestic and monumental about seeing them play what felt like a private function for 25,000 or so of our closest friends, according to the charming and perpetually twirling Chassagne. They were that good live, and I consider myself extremely fortunate that I was front row (just to the left of) centre to experience it all. I wont soon forget the rush I felt when Neighborhood #3 (Power Out) started up, or the explosion of confetti fireworks as Wake Up brought an incredible first day of Osheaga to a close. Galactic is one of those ensembles I had always heard great things about in relation to fests like Voodoo in New Orleans. It was a treat to see (And hear!) them bring their funk-a-fied trumpet and saxophone sounds to Montreal. I think a lot of early risers learned that dancing to this type of music is a fantastic way to work off ones hangover from the evening before! Now that I think about it, Im sure Ive heard them on our local modern rock station, 102.1 The Edge. Surprised it hasnt been more, although I highly doubt they’d play one song I heard, “Soldiers on LSD”. 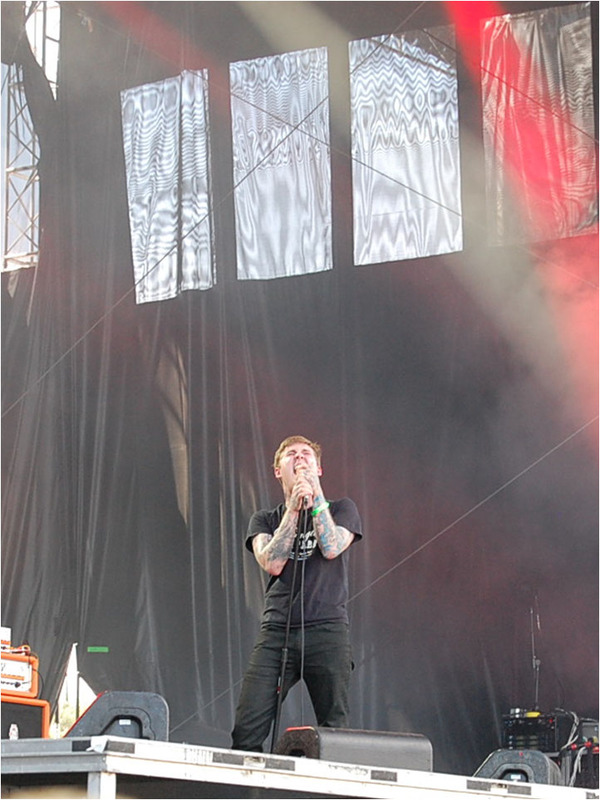 Osheaga marked the second time Ive seen The Gaslight Anthem (the other instance being at Lollapalooza last year). I found it cute in a punk rock sort of way how singer and guitarist Brian Fallon (you know, the nice young man with all the tattoos) seems genuinely astonished at the success of his New Brunswick, New Jersey new millennium rock n roll band. Lets see if we can try to have some fun, he started with. The thousands of us watching, clapping and occasionally moshing for the next 40 minutes werent worried about this in the least. All niceties aside, that is a pretty badass stage backdrop they have, and their songs are just as cool. Pretty tough to pick one or two as the best out of the ten they played, but I really like “We Did It When We Were Young”, from their latest album American Slang. As I made my way to Parc Jean-Drapeau by subway, I ran into a surprising number of fellow Torontonians. When I asked who they were most looking forward to seeing on Sunday, nearly every single one of them had The Black Keys at the top of their list. They didnt let any of them down, as the Keys absolutely blistered through a 10 song set dominated by selections off of their 2010 record Brothers (as well as a new song called “Chop and Change” from the Eclipse soundtrack of all things). While I have nothing but positive things for the most part to say about Osheaga organizers evenko, Im seriously thinking of filing a civil lawsuit over one of the best live acts in music today only getting a 40 minute timeframe in which to work their magic. I guess I can take solace in the fact that skin beater extraordinaire Pat Carney, soulful blues shredder Dan Auerbach, and their new friends Nick on bass and Lee on keyboards will be playing full sets at two sold-out Toronto shows following their Montreal stop. And on a side note, am I the only one who thinks Snoop Dogg should have been in this 420 slot? 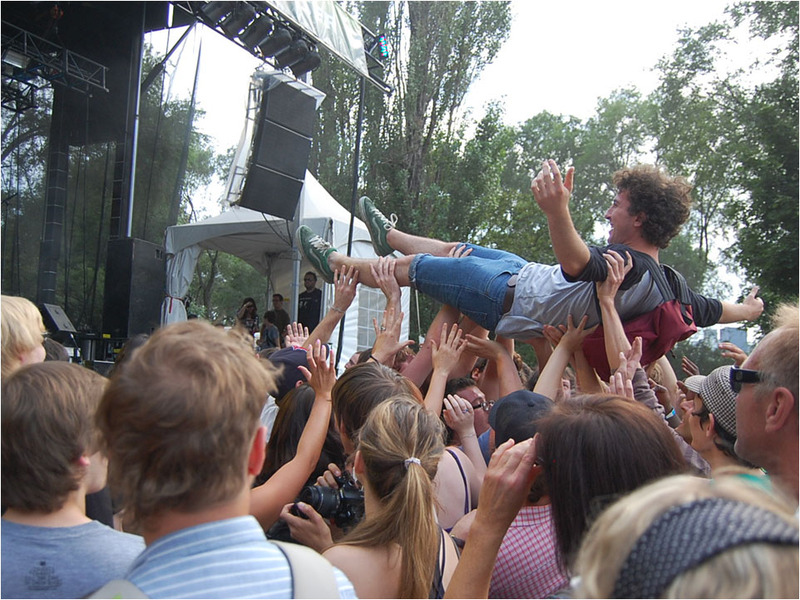 If visitors from Toronto were most looking forward to seeing The Black Keys, then the equivalent for Montrealers were indie sensations We Are Wolves. 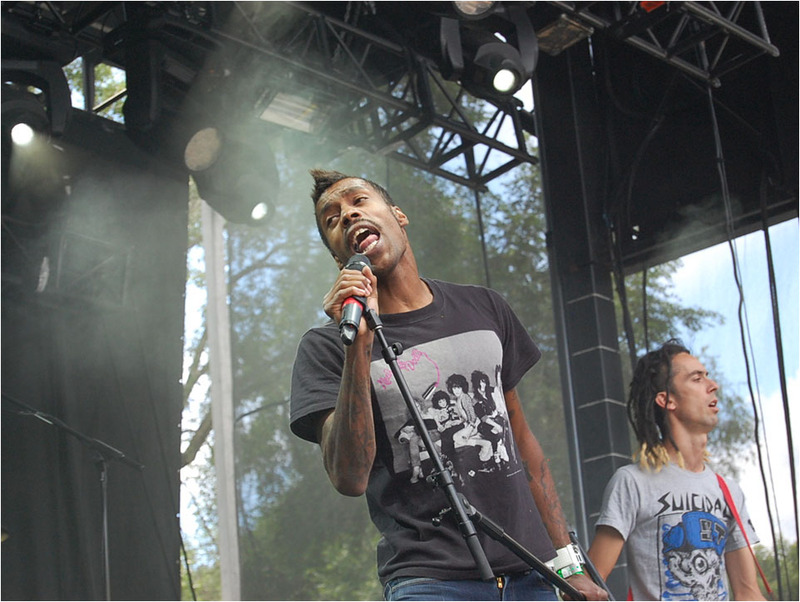 The friends I was at Osheaga with were adamant that they be one of my must-see bands. At first I started to wonder what I had got myself into when I saw three Gothish-looking guys emerge from behind the curtain wearing bizarre, kite-like apparatuses. Once they began their heavily distorted electro rock though, which I tried to coin new age industrial, as there were shades of old school Ministry and their drummer STOOD for the entire 45 minutes, I was hooked. I didnt know the names of any of their songs (then again, neither did any of mes amis), and I couldnt understand many of vocalists Alexander Ortizs lyrics, but like almost everything about Montreal, it was soooo good! You know how sports fans are always saying how they would want to see legendary players theyve only heard about? Well for the longest time I was saying the same thing about The Jon Spencer Blues Explosion. I would like to take this opportunity to state publicly, without hyperbole, that I can die a happy man because I have finally seen them in concert. I have been going to shows for twenty years, and this was by far the loudest one I have ever, ever, ever been at. I was on the rail, standing in front of a subwoofer, silently cursing that I hadnt brought earplugs. (Not that anyone could have heard me swear!) The bass was so freaking loud that a bunch of us found ourselves huddling around a one litre bottle of water someone had dropped that was literally becoming carbonated from the whole lotta shakin going on. Jon Spencer was like a runaway freight train hijacked by Elvis Presley. 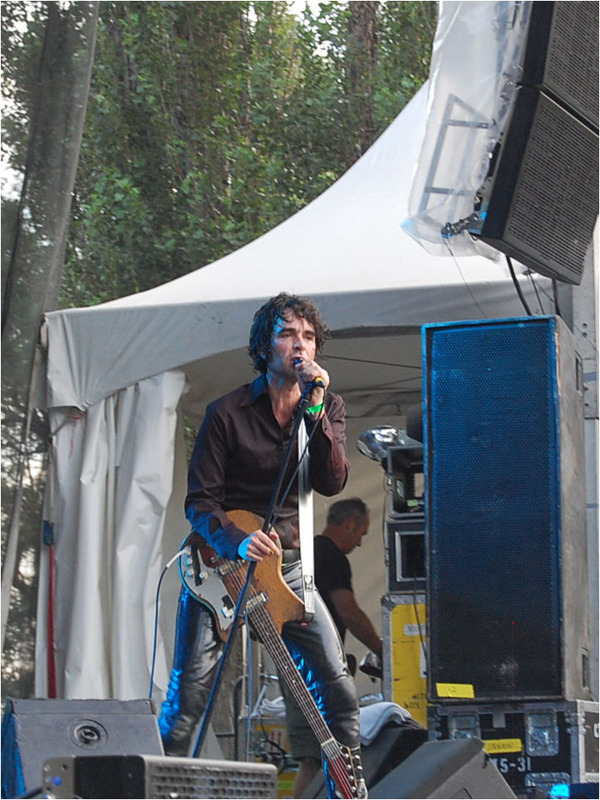 When he wasnt shouting out the names of the next song at other JSBX members Judah Bauer and Russell Simins before trying to start without them, he was constantly displaying his flexibility by bending down on one knee in his tight leather pants, taking a breather only to yell Blues Explosion! as loud as he could into his mic. It was glorious, and it hurt to leave the scene of this musical car crash, but it was time to check out one of the main events. If t-shirt sales are any indicator of a bands status, then Metric deserved a line to themselves at the top of the Osheaga poster. It seemed that every second person I saw Sunday was a pretty blonde girl modeling a white Metric tee with their stenciled logo and Emily Haines face on it. 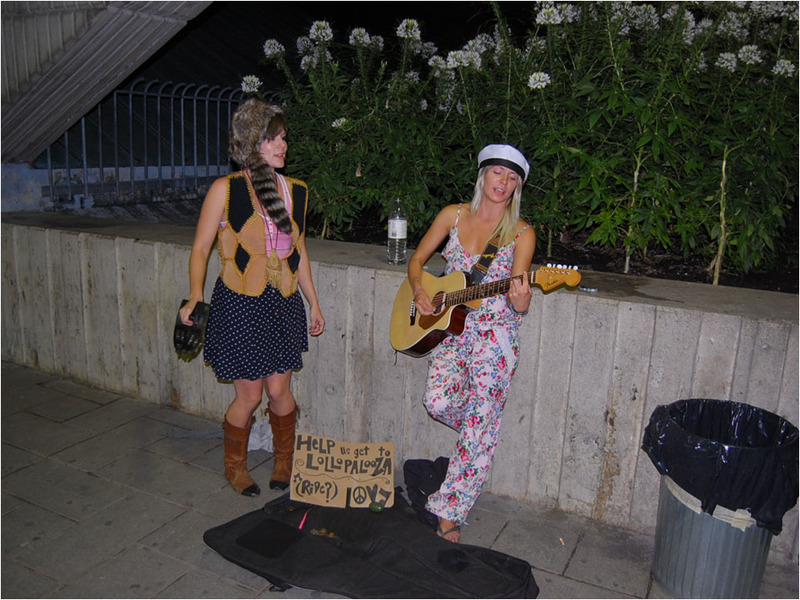 Any celebrity she and her three male band mates have achieved has been earned, mainly from playing show after buzz worthy show since they self-released their latest album Fantasies in April of last year. For any American indie rock aficionados who may not yet be familiar with her, no reasonable facsimile can compare to Metrics effervescent frontwoman. The only way to really describe her is as a little dynamo in high heels, her golden, shoulder length hair blowing in the wind while strutting her stuff in a glittering silver micro-minidress, singing her heart out on songs like “Black Sheep” and “Empty” as well as surprising with a cover of the Beastie Boys “Fight for Your Right”. They also had the biggest VIP section of people watching them side stage by far. They may have been privileged, but they were pumping their fists as hard as anyone in the crowd to “Help Im Alive”, and reacted just as explosively at the riff to “Gold Girls Guns”. Having already seen main stage headliner Weezer at Ottawa Bluesfest two weeks prior, I thought Id indulge in somewhat of a guilty pleasure and catch a bit of Devo to cap off what has probably been the best all-around festival I have attended since Lollapalooza in 1994. I didnt think anything was ever going to touch The Smashing Pumpkins in their prime (before Billy Corgan shaved his head and started going cuckoo) on top of the Beastie Boys unleashing “Sabotage” and the rest of Ill Communication on alternative audiences, but I think we have a new winner! I should probably mention that the Sennheiser-sponsored stage I spent an awful lot of time at was entirely green powered. Unfortunately, though, I never was able to confirm if that was because of all the Devo energy domes seen around Parc Jean-Drapeau all weekend. But onto their show! Playing up the music video pioneer reputation they established in the 80s, Devo had a giant wall behind them spastically flashing images non-stop. A true sensory overload. 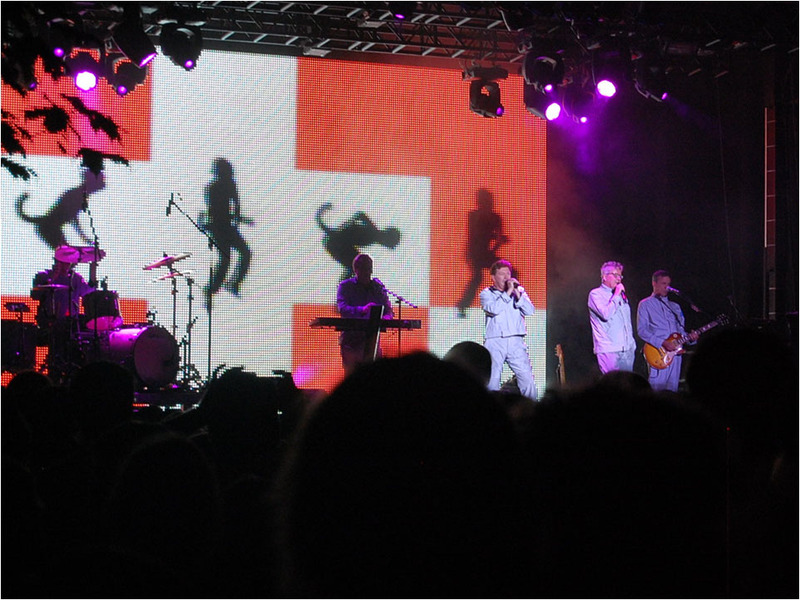 Devo sent everyone home happy with new wave classics such as “Peek-a-Boo!”, “Girl U Want”, and, of course, “Whip It”. Ive personally become a fan of their new album Something for Everybody, especially set opener “Dont Shoot (Im a Man)”, wacky waving inflatable arm-flailing tube man and all!